Come get your Irish on a month early! We're throwing a party to help raise funds for the Cape Cod St. Patrick's Parade that takes place in Yarmouth on March 9th! We'll have live music in the form of a traditional Irish Sessiun, food, and Cape Cod Beer will be releasing Shillelagh a special Irish Pale Ale for the occasion. 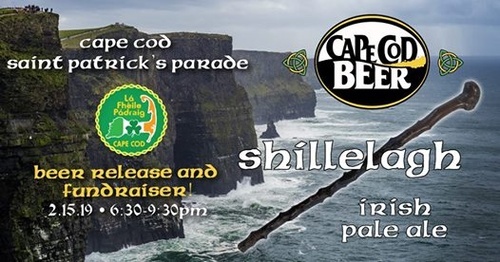 A portion of the proceeds from the sale of Shillelagh will go directly to support the parade. Your ticket includes admission to the event and a custom, collector's Cape Cod Saint Patrick's Parade pint glass. Cash bar. 100% of your ticket price goes to supporting the parade. Get your tickets now - we expect this fun event to sell out!